My apartment is slowly but surely emptying. The majority of my things are already in Chicago, and I'm making good progress on moving the rest - either packing it up for the last round of boxes, leaving it in a box outside my office marked "free" (lots and lots of books), or selling it on Craigslist. I sold it this weekend to a local couple looking to get something for their grandson, to encourage him to get more active. I hope he enjoys it as much as I did, and I hope it's better for his health than it ended up being for mine. Biking shaped so much of my experience here in California. Besides the calorie burning benefit, my main objective with getting a bike was functional: since I don't have a car (or a drivers license, for that matter), it was my main mode of transportation, getting me to and from work, the grocery store, and around town. Shortly after meeting one another, Justin and I ran into each other a few times while biking to work. I'd continue straight on Yosemite to Lake and he'd turn left at G and right onto Bellevue. And he marveled at how fast I was, how I always beat him to campus. And I told him, Well, of course - I'm an athlete. It was a few days before our first date; I still believed it confidently. 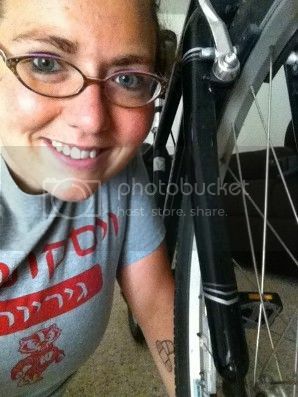 When the original bike was stolen in February, I grieved so hard - it was my broken iPod all over again. I wasn't just aching for the material loss, it was a connection to the experience of the previous semester. I wasn't just hurting for the bike, I was hurting for him. The loss was overwhelming, and in a lot of ways, I'm still hurting - something the replacement bike just couldn't fix. Even before, practically from the beginning even, the bike was my main source of entertainment. I didn't have any family or friends here other than Justin, his two co-workers that we occasionally had dinner with, and the three or four girls from the book club ("friends" being used rather loosely here, of course). And at my new employee orientation shortly after being hired, a woman asked what there was to do in this town; the girl leading the orientation replied, in all honestly, that she enjoyed online shopping. Coming from Chicago, an incredibly vibrant and culturally rich city, this was a difficult transition. So, I'd head to work, teach, hold my office hours, head home, grab some lunch, and then head out and spend a few hours biking. It always bugged me when I'd hear people say they started biking to work and suddenly lost 7, 10, 15 pounds. I biked to work! Heck, I biked EVERYWHERE! So where was my loss? Well, here's part of the problem: for me, 1 mile of running burns about 150 calories, 1 mile of walking burns about 100 calories, and 1 mile of biking burns about 50. That seems small, until you factor in miles per hour - I walk 3-4 miles per hour (let's call that 350 calories), run 6 miles per hour (900 calories), and ride 12-15 miles per hour (750 calories). I rarely run 6+ miles more than once a week, but 1-2 hour bike rides? I could do them daily - and more often than not, I did. A two-hour bike ride burned 1300-1500 calories. So why didn't I lose any weight?! Because when you move like that all the time, your body adapts. You have to mix up your workouts to keep your body always guessing. In Chicago, I typically did three days of running (one long, two shorter) alternating with three days of elliptical/stationery biking/basic weight training. It was always different. Here, it was always biking - there was more running in the Fall semester as I prepared for my half marathon, but in the Spring, when I wasn't actively training for a longer race, I filled most of my afternoons with biking. Also, when you bike for hours and hours every day, you feel hungrier. Your body needs more fuel. And I struggled to find a healthy balance for myself. It seems like most days were either "bike a ton, feel extra hungry, overeat, get depressed" or, more often, "get depressed, overeat, feel extra guilty, bike a ton." Neither situation is good for my health - physical or mental. As much as I'll miss biking, it's definitely for the best right now. In the two and a half weeks I have left in California, I can't depend on the bike for big calorie burns. The gym membership, which was only good for 30 days, ran out a few days ago. And the TV is gone, so no Wii Fit. With running and walking as my only workout options right now, I have to pay closer attention to my eating, to find my healthy balance. I am still doing well with my June goal of no binges, thanks mostly to training for the Chicago Marathon (and the Rock 'n' Roll Chicago Half Marathon at the end of July) - knowing I have to wake up the next morning and run 6, 7, 8 miles makes the "should I order a pizza?" decision a lot easier. What about you? How do you find a good balance between eating and exercise? I exercise at night, about an hour or two after eating dinner. When I finish exercising, I drink a ton of water and take a shower. By then, it's almost bedtime. If I'm hungry, I eat an apple or something really tiny. Usually, I'm too tired to feel hungry, and since I've eaten all day, my body is fueled. It's very rare that I'm hungry after exercising at night. Plus, by the time my body realizes I've burned off most of those calories, I'm already asleep and don't feel the hunger. Haha, body. ;) I do wake up hungry, but it's time for breakfast at that point, so I get to eat! Yay! I found that if I exercise in the morning, I'm ravenous all day, so I switched it up. Plus, I hate getting up early. I love getting my workouts done and over with in the mornings, but I find that I'm so hungry the rest of the day. With my current work schedule, I can't work out in the morning and I think that's a good thing. I find exercising suppresses my hunger for a little bit as well. So if I work out after work, I have some time to make a good dinner before I get too hungry. If I don't workout after work, then I'm starving by the time I get home and normally start snacking while cooking dinner. That particular balance has been the hardest for me to find, but sub running for cycling. When I was marathon training, I couldn't for the life of me find my "sweet spot" in terms of eating/burning calories. Like you, shorter workouts of varying intensity - constantly changing things up - seem to be the way forward. Or downward, as it were. I exercise in the evenings. I love my sleep so much that I find it difficult to get up any earlier that I have to since I have to be at work at 7am. I do however find myself waking up in the middle of the night starving, which I am trying to find ways to stay asleep all through the night. Balance between eating and exercise is something I'm always struggling to find. Sometimes I think I have it figured out and other times I totally don't! I think it might be something I always have to be aware of! I think it's starting to become more natural though... I hope! Still working on it Mary! I can be a bit compulsive with exercise, too, mainly on the arc trainer. I struggle with a balance to do both food and exercise. Some weeks are good and some are horrible. I just have to keep trying and hoping something works. I also tend to get bored with my workouts so I have to find the right variety to keep me motivated. I think that's been the most frustrating part about this journey - finding the food/exercise balance. Still working on it!! You will love the Rock and Roll Half Marathon. I did the Portland one and had a great time! The balance will always be a process in learning for me - but I'm at the point where I have at least a few good days of balance at a time. So excited for your move back! I know exactly what you mean by wondering why you weren't losing weight despite the daily rides. I was walking 50+ miles a week and struggled to see any loss at all. It was so frustrating! !